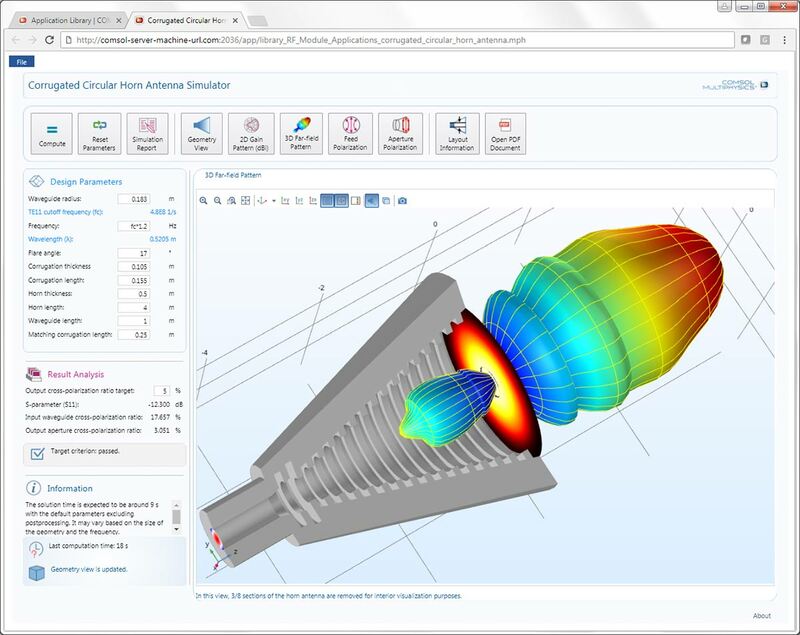 The COMSOL Server™ product helps you spread the benefits of simulation throughout your organization. 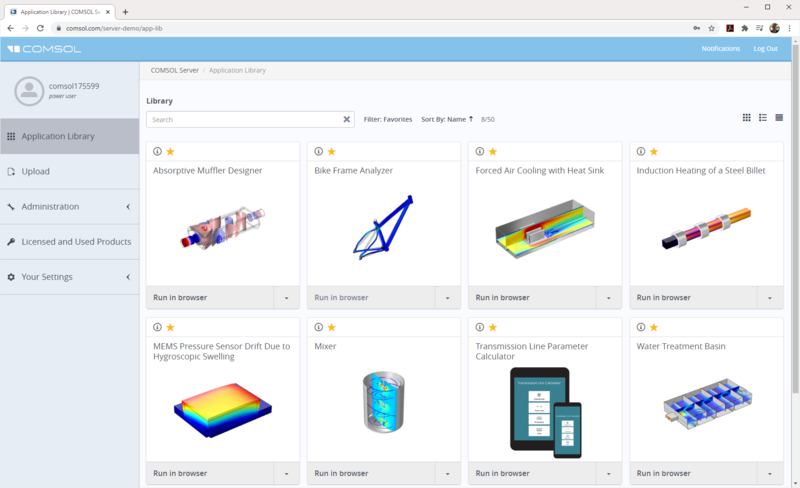 As the platform for deploying and running applications built by your in-house simulation experts, COMSOL Server™ enables you to streamline the R&D workflow, efficiently share knowledge and analyses across departments, and rapidly respond to customers' needs. The web interface for COMSOL Server™ comes with administrative tools that enable your organization to manage access to the applications you have uploaded, user accounts, user groups, and multiprocessor utilization. Administrator-verified end users can upload, access, and run applications housed in the Application Library of COMSOL Server™ through web browsers or a desktop-installed client. Why Do I Need COMSOL Server™? What Do I Get in COMSOL Server™? Where Is COMSOL Server™ Installed? What Is the Difference Between COMSOL Server™ and COMSOL Compiler™? When the simulation experts in an organization turn their models into applications, the overall simulation, design, and manufacturing workflow improves. The simulation expert no longer has to rerun the same or slightly different analyses for other collaborators or customers and the organization can spread the advantages of simulation to a larger group of people. To build their own computational applications, your simulation experts need COMSOL Multiphysics® with its built-in Application Builder. To make these applications accessible to many people at a fraction of the cost, your organization needs COMSOL Server™. Each simulation application has its own customized user interface, where the application creator can control the inputs and outputs that the application user can apply and manipulate. Experts create these apps by including only the parameters relevant to the design of a specific process or product. This better transfers the simulation expert’s knowledge and experience to the people involved in the design and manufacturing processes across all engineering disciplines in an organization — even those without prior simulation experience. The simulation expert brings theoretical knowledge and the power of simulation to the optimization of a design or process. Other project stakeholders can then bring their own experiences of building or operating these designs and processes to the overall workflow by using the simulation application and, potentially, providing feedback to the simulation expert. To make such an augmented workflow a reality, the applications need to be easy to distribute, access, and run. COMSOL Server™ is the product for deploying applications and bringing them to the hands of colleagues and team members. It is also the hub for managing many different applications over multiple functions or operations in an organization. COMSOL Server™ has exactly the same computational demands per user as COMSOL Multiphysics®. Through applications, COMSOL Server™ gives users access to the same powerful simulation technology that is found in COMSOL Multiphysics®. All users logged into the COMSOL Server™ product can run applications on the computer where it is installed. Alternatively, the load can be distributed by installing COMSOL Server™ to run applications on multiple computers. In that case, one computer is set as the primary server for handling user account and access management, and a series of other computers are used for computations, called secondary servers. It is also possible to have multiple sets of primary and secondary servers, all controlled by a single license manager, which is useful if you have teams that want to only use the computational resources that are allocated for them. When a user runs an application via the web browser or COMSOL Client, their own computer or mobile device does not need to perform the multiphysics calculations. These can all be done on the server computer(s). Since you are controlling the access and use of applications through a centralized hub, any changes or updates you make are immediately available to all users. You can run up to four application sessions per concurrent user. By using cluster computing technology with COMSOL Server™, it is possible to configure applications to run on a variety of cluster architectures. For applications designed to distribute the computational workload, computations can be run in parallel for large parametric sweeps or large models. A COMSOL Server™ license is enabled out-of-the-box for an unlimited number of cores and compute nodes without extra licensing fees. Applications are easy to use and with COMSOL Server™, they are easy to access, deploy, and share, too. You can install the COMSOL Server™ software anywhere you would like. Typically, COMSOL Server™ is installed on a server or cluster within your organization's network, but it can also be installed for offline or personal use on a laptop or desktop computer. Applications are run through any popular web browser, such as the Google Chrome™, Firefox®, Internet Explorer®, Microsoft Edge®, or Safari® browsers. You do not need any plugins to run an application, yet you get immediate access to interactive 1D, 2D, and 3D graphics. On native Windows® operating systems, you can also run applications from an installed thin desktop client, COMSOL Client for Windows®, which can be downloaded for free from the Product Download page. If your application was built using components from one of the LiveLink™ products for CAD and it requires a connection to the third-party CAD program, then you need the desktop client. While the Application Builder requires the Windows® version of COMSOL Multiphysics® to build applications, COMSOL Server™ is more flexible. You can run applications on Windows®, Linux®, and macOS platforms, as well as any operating system that supports most web browsers. COMSOL Server™, and the applications that will be run on it, can also be embedded into machines and equipment that support the Windows® or Linux® operating systems or macOS. An example of a simulation app being run in a browser. As the administrator, you have complete control over your organization's applications, including who can access and run them, via the web interface in COMSOL Server™. The main dashboard presents available applications in a straightforward Application Library format. From here, it is easy to launch applications and control their permissions within your organization. Different menu items on the dashboard lead you to interfaces for monitoring your CPU and memory usage and controlling your sessions that are running applications. If COMSOL Server™ has been installed on several computers, the primary server's web interface gives you an overview of all user sessions across all secondary servers. You can create and control user accounts and user groups, either on the fly or by linking to preexisting user databases on your network based on either Active Directory by Microsoft® or LDAP. From the level of an administrator or power user, you can also set permissions for user groups and grant Application Library access to users so that they can upload and edit applications. Other tools allow you to control where applications can be run using multiple cores or clusters, or restricted to a one-application-per-core basis. Want to customize the web interface and your applications to match your organization's branding? Easy-to-use tools enable you to make the Application Library in COMSOL Server™, the applications that you run, and the web interface all your own. After you have installed COMSOL Server™, you decide who can access and run applications on it. COMSOL Server™ incorporates favorable licensing to allow maximum and flexible use. You can allow access to multiple users within your organization or, if you wish, your external vendors, clients, partners, or customers. You can also grant access to your applications and allow users to run them on your COMSOL Server™ license from anywhere in the world. You can even host your license on a virtual private cloud (VPC) and be paid for use of your applications and license of COMSOL Server™ by third parties. COMSOL Server™ supports the same set of add-on products and modules as COMSOL Multiphysics® does. If you want to distribute applications for teaching and academic research purposes, then COMSOL Server™ is also tailored to your needs. COMSOL continuously supports academic research through the use of simulation. In fact, we consider simulation applications made by students, researchers, and faculty to be publications for the academic world, similar to papers and articles published by universities and journals. An application provides a more sophisticated presentation of a simulation model than merely placing figures and graphs into an article — and we believe it should be made available to your colleagues. This includes allowing them to view and run your applications on your institution's Academic Server License, even if they do not belong to your institution.